Comment: In her commentary on this text, Professor Mitzi J. Smith writes, “Something in Peter died that day and something in Peter resurrected. Inclusivity began to replace prejudice.” (http://www.workingpreacher.org/preaching.aspx?commentary_id=896) Sometimes, without our even realizing it, our traditions lead us to a prejudiced way of life. 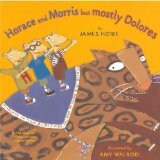 This is true for best friends Horace, Morris, and Delores. They stop playing together because “a boy mouse must do what a boy mouse must do,” and “a girl mouse must do what a girl mouse must do.” Like Peter, the mouse friends experience a moment of resurrection when they make the decision to move towards inclusivity. Comment: As Paul speaks to the Corinthians about Christ’s resurrection, he is encouraging to move beyond their anxieties, and to expect more. 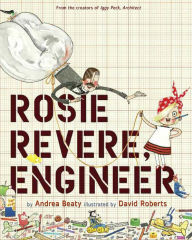 “His challenge was to help the Corinthians realize that God has yet more in store for them, beyond this life.” (http://www.workingpreacher.org/preaching.aspx?commentary_id=555) Rosie Revere is also stuck in her anxieties, convinced the failure of her invention means she’ll never be an engineer. Rosie’s great aunt Rose helps Rosie understand that failure is the first step towards a successful invention. Like Rosie, we in the church are also held back by our fears and failures. We need the voices of Paul, and other encouragers like Aunt Rose, to help us see and believe in all God has in store. Comment: “We watch as Mary, Peter, and an unnamed disciple discover that Jesus’ tomb is now empty; the outward and visible sign that Jesus has conquered death and a new creation has begun.” (http://www.workingpreacher.org/preaching.aspx?commentary_id=1236) Lucy Lind Hogan encourages readers to view this passage not as the end of a story, but a new beginning. This cycle of life, death, and new life is mirrored in Melmed’s Little Oh. 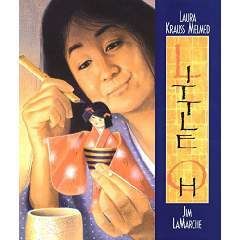 A woman and her origami daughter believe they have a full and joyful life together. When the origami girl is lost, both grieve. When the girl is found by a boy and his father, Little Oh and her mother, along with the boy and his father come to find themselves in a new beginning. This text and story serve as a invitation to explore the stories of life, grief, and new beginnings filling the pews of your own congregation. We welcome Noell Rathbun-Cook, Union Presbyterian Seminary alumna, as our Lectionary Links writer for the next four weeks. Lectionary Links: Sunday, March 27, 2016 (Easter) by Storypath is licensed under a Creative Commons Attribution-NonCommercial 4.0 International License.